WARNING: Raloxifene may infrequently cause serious blood clots to form in the legs or lungs. Tell your doctor if you have history of blood clots (e.g., deep venous thrombosis, pulmonary embolism). Also talk to your doctor about risk factors for developing strokes (sometimes fatal) while taking this medication. Some risk factors include tobacco use, alcohol use, having high cholesterol/diabetes, or history of heart disease. Discuss these risks and the benefits of using raloxifene with your doctor. USES: Raloxifene is used to prevent and treat bone loss (osteoporosis) in women after menopause. Maintaining strong bones by slowing bone loss helps to reduce the risk of fractures. Raloxifene may also lower the chance of getting a certain type of breast cancer (invasive) in women after menopause. This drug is different from hormones (including estrogens and progestins). It works by acting like estrogen (as a selective estrogen receptor modulator or SERM) in some parts of the body. 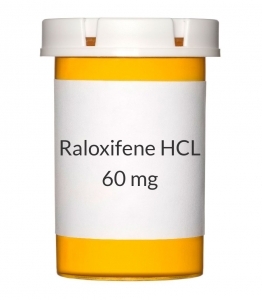 Raloxifene helps to preserve bone mass, but it does not affect the breast and uterus like estrogen or relieve symptoms of menopause such as hot flashes. This medication is not recommended for use in women before menopause. It should not be used in children. This medication should not be used to prevent heart disease. HOW TO USE: Read the Medication Guide provided by your pharmacist before you start using raloxifene and each time you get a refill. If you have any questions, consult your doctor or pharmacist. Take this medication by mouth usually once a day, with or without food, or as directed by your doctor. Use this medication regularly to get the most benefit from it. Remember to use it at the same time each day. Be sure to include adequate amounts of calcium and vitamin D in your diet. Consult your doctor or pharmacist to see if you need to take calcium/vitamin D supplements. Since this drug can be absorbed through the skin and lungs and may harm an unborn baby, women who are pregnant or who may become pregnant should not handle this medication or breathe the dust from the tablets. SIDE EFFECTS: Hot flashes, sweating, or leg cramps may occur. If these effects persist or worsen, notify your doctor or pharmacist promptly. Remember that your doctor has prescribed this medication because he or she has judged that the benefit to you is greater than the risk of side effects. Many people using this medication do not have serious side effects. Raloxifene may infrequently cause stroke or serious blood clots to form in the legs, lungs, or eyes. Seek immediate medical attention if any of these unlikely but serious side effects occur: leg swelling/pain, trouble breathing, chest pain, sudden vision changes, severe headache, weakness on one side of the body, confusion. A very serious allergic reaction to this drug is rare. However, seek immediate medical attention if you notice any symptoms of a serious allergic reaction, including: rash, itching/swelling (especially of the face/tongue/throat), severe dizziness, trouble breathing. This is not a complete list of possible side effects. If you notice other effects not listed above, contact your doctor or pharmacist. In the US - Call your doctor for medical advice about side effects. You may report side effects to FDA at 1-800-FDA-1088. In Canada - Call your doctor for medical advice about side effects. You may report side effects to Health Canada at 1-866-234-2345. PRECAUTIONS: See also Warning section. Before taking raloxifene, tell your doctor or pharmacist if you are allergic to it, or if you have any other allergies. This product may contain inactive ingredients, which can cause allergic reactions or other problems. Talk to your pharmacist for more details. This medication should not be used if you have certain medical conditions. Before using this medicine, consult your doctor or pharmacist if you have: active or past history of blood clots (e.g., deep venous thrombosis, pulmonary embolism, retinal vein thrombosis). Lack of movement may increase the risk for blood clots. Your doctor will instruct you to stop taking this medication at least 3 days before surgery or during long periods of inactivity (e.g., bedrest). Do not start taking raloxifene until you are routinely and actively moving again. During long periods of travel, walk or move periodically to keep the blood flowing through your body. Before using this medication, tell your doctor or pharmacist your medical history, especially of: kidney disease, liver disease, high blood pressure, smoking, heart/blood vessel disease (e.g., congestive heart failure, atrial fibrillation, stroke, transient ischemic attack), cancer, high blood cholesterol levels, history of high blood fat (triglyceride) levels due to estrogen treatment. This medication must not be used during pregnancy because it may cause harm to an unborn baby. If you become pregnant or think you may be pregnant, inform your doctor immediately. It is not known whether this drug passes into breast milk. Breast-feeding while using this medication is not recommended. Consult your doctor before breast-feeding. DRUG INTERACTIONS: Your doctor or pharmacist may already be aware of any possible drug interactions and may be monitoring you for them. Do not start, stop, or change the dosage of any medicine before checking with them first. Before using this medication, tell your doctor or pharmacist of all prescription and nonprescription/herbal products you may use, especially of: cholestyramine (or other anion-exchange resins), estrogens. This product can affect the results of certain lab tests. Make sure laboratory personnel and your doctors know you use this drug. This document does not contain all possible interactions. Therefore, before using this product, tell your doctor or pharmacist of all the products you use. Keep a list of all your medications with you, and share the list with your doctor and pharmacist. NOTES: Do not share this medication with others. Keep all appointments with your doctor and the laboratory. You should have a complete physical examination, breast and pelvic examination, and PAP test (for vaginal cancer) at least once a year. You should also have periodic mammograms as determined by your doctor. Follow your doctor\'s instructions for examining your own breasts. Report any unusual vaginal bleeding, breast pain, or lumps immediately. Lifestyle changes that help promote healthy bones include increasing weight-bearing exercise, stopping smoking, limiting alcohol, and eating well-balanced meals that contain adequate calcium and vitamin D. Since you may also need to take calcium and vitamin D supplements and make lifestyle changes, consult your doctor for specific advice. Laboratory and/or medical tests (bone density tests, x-rays, height measurement, blood mineral levels) should be performed periodically to monitor your progress or check for side effects. Consult your doctor for more details. STORAGE: Store the US product at room temperature between 68-77 degrees F (20-25 degrees C) away from light and moisture. Brief storage between 59-86 degrees F (15-30 degrees C) is permitted. Do not store in the bathroom. Store the Canadian product at room temperature between 59-86 degrees F (15-30 degrees C) away from light and moisture. Do not store in the bathroom. Keep all medicines away from children and pets. Do not flush medications down the toilet or pour them into a drain unless instructed to do so. Properly discard this product when it is expired or no longer needed. Consult your pharmacist or local waste disposal company for more details about how to safely discard your product.